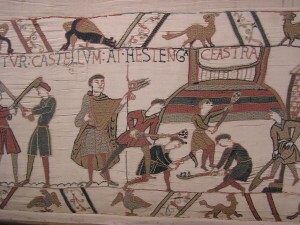 The Bayeux Tapestry, made within about ten years of the Battle of Hastings, splendidly illustrates the military architecture of the time. There are five depictions on the tapestry of ‘motte-and-bailey’ castles – those that consisted not of battlemented stone walls and lofty towers, which are characteristic of a later period, but of earthworks and wooden palisades. The bailey or courtyard was usually on high ground, surrounded by a deep ditch and entered by means of a drawbridge. It was intended to accommodate an entire community. To one side of the bailey, or occasionally in its midst, was the motte, a great cone of earth topped by a wooden stockade, where there was space only for the lord and his immediate entourage. The banks of mottes were notoriously steep and difficult to storm. These were relatively cheap, hastily-erected fortifications, which any peasant or soldier had the skills to construct. They had proved their usefulness during the minority of William the Conqueror, when Normandy had been ravaged by private wars. The erection of numerous motte-and-bailey castles had been a feature of this dark period, when country people had had to organise their own defence, sometimes under the leadership of the parish priest. Many of the feuding families of that time, such as Montfort, Tosny, Beaumont and Montgomery, were subsequently to participate in the conquest of England. As they spread across the land, reaping their rewards, they erected yet more motte-and-bailey castles as a means of subduing the native population, who had enjoyed years of peace and stability and were unfamiliar with castles of any kind. 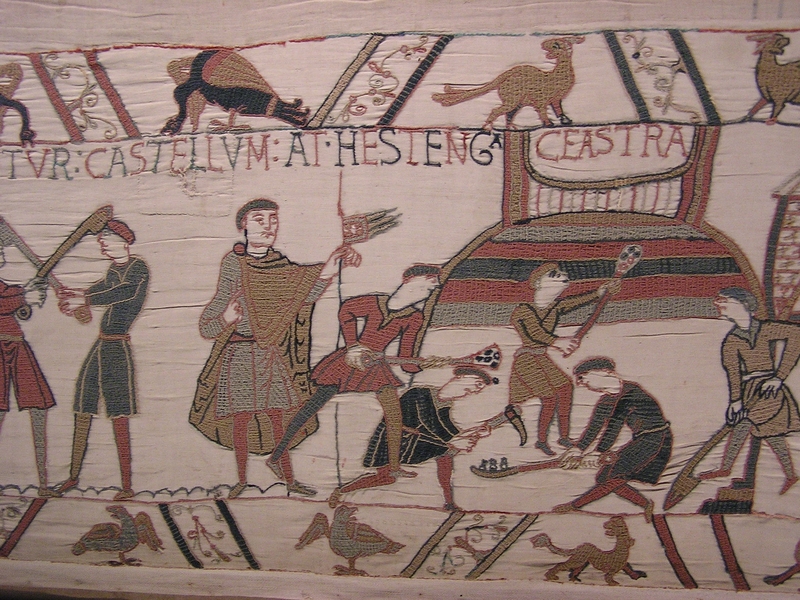 The Englishman who designed the Bayeux Tapestry, thought to be an artist of the Canterbury School, had clearly experienced the post-Conquest castles at first hand. 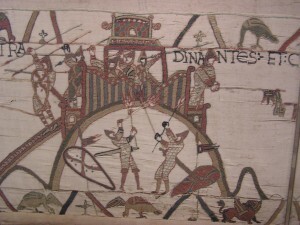 In some of the early panels of the Tapestry, we see Harold and William participating in a minor campaign in Brittany. The artist depicts the Breton castles of Dol, Rennes and Dinan, which he would never have seen, as typical motte-and-bailey castles, though all three were probably at least partially built of stone. The ducal castle at Bayeux is also credited with a motte which, in reality, it never had. The observant artist is very precise in matters of detail. The tower at Dinan appears to consist of a fighting platform raised on stilts. Evidence of such a tower has been found at Abinger in Surrey. He neatly illustrates the inherent weaknesses in their design. Wood is flammable, and the Normans have only to apply firebrands to the walls of Dinan in order to smoke out their enemy. Moreover, it is not possible to raise walls of wood to any great height: those at Dinan are so low that the surrendering rebel, Conan, is able to lean over them and pass the heavy keys of the castle to William at the end of his lance. Further on, we see the construction, within days of the landing, of a motte-and-bailey castle at Hastings – ‘at Hestenga caestra’, according to the caption. (The Latin should have read ‘ad Hestenga castra’; by slipping into his own tongue, the artist reveals his nationality.) The Englishmen conscripted to perform the task, all armed with shovels, seem thoroughly disgruntled. Such unhappy scenes were soon to be enacted across the land. At least 84 motte-and-bailey castles had been raised in England by the end of the eleventh century. There are examples in every county. In some cases, temporary wooden walls had soon given gave way to more permanent ones of stone. Castles like Dover, founded by William the Conqueror on the motte-and-bailey pattern, are still dominant features of our landscape. 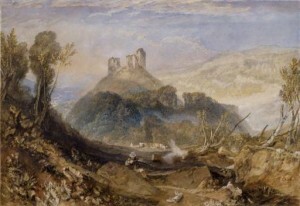 The subject of two watercolours and other sketches by Turner – the one illustrated above dates from about 1826, and is in the National Gallery of Victoria in Melbourne, Australia – Okehampton, on the edge of Dartmoor, is a castle of the motte-and-bailey type. Early in 1068, William marched into Devonshire at the head of his army, intent on mopping up the remaining pockets of resistance. He took the surrender of Exeter and threw up a castle there, before proceeding into Cornwall, where a further four such castles were swiftly raised. William gave the lordship of Exeter, and of 200 other manors in Devonshire, to his second cousin Baldwin de Meules, the son of his former tutor, Gilbert, Count of Brionne. By the time of Domesday Book (1086), Baldwin, now called ‘the Sheriff’, had built his chief residence on a raised spur at Okehampton. The motte there, formed of material cut from the surrounding rock, rose a further 80 feet above the natural level. Unusually, it was surmounted from the start by a tall, square tower of stone, which may, indeed, have been three storeys high. The earliest fortifications at Okehampton seem otherwise to have been of wood. Meanwhile, Baldwin’s brother, Richard FitzGilbert de Clare, was acquiring estates at the opposite end of the country, including the lordship of Tonbridge in Kent, where he built an equally impressive motte that commanded the Medway crossing. Richard was one of William’s inner circle, a mere eleven men among whom he distributed about half the land of the conquered kingdom, apart from that held by the church. The Saxon thegns whom they displaced, men like the shadowy Osfrith at Okehampton, were, if not already killed or exiled, simply dispossessed. As for Okehampton, it was the eventual inheritance of Baldwin’s great-granddaughter, the lady Hawise, who married Renaud de Courtenay. Their descendants – hereditary sheriffs of Devon, keepers of Exeter Castle and, from 1355, Earls of Devon – have been, ever since, the foremost family in the county. Okehampton Castle was abandoned by the Courtenays in 1538, and is now a romantic ruin, but the present (Eighteenth) Earl, seated at Powderham, near Exeter, continues to occupy ancestral land. The new ruling class imposed by the Normans has proved remarkably durable. As Melvyn Bragg points out in a recent article, ‘more than half the land is still in the hands of the ancient looters from the time of the Conquest to the Dissolution of the Monasteries and the occupation of the common land’. To describe the current Earl of Devon in such terms seems a little strong. One has to concede that, as far as Baldwin or Richard are concerned, Lord Bragg has a point. (David C. Douglas, William the Conqueror, London, 1977, pp.41-3, 213, 216-17, 269; Lucien Musset, The Bayeux Tapestry, Woodbridge, 2005, pp.138, 144; Alan Endecott, Okehampton Castle, Devon, English Heritage Guide, 2003. For Melvyn Bragg’s article, see http://www.telegraph.co.uk/culture/9093724/British-culture-may-be-our-new-great-industry.html.